This collection of nursing quotes and sayings give you a sense of what this profession is all about. Care and duty are some of the first thoughts that come to mind when you think of a nurse. A nurse is much more than a health care professional. They can touch your lives just once and become someone whom you will remember for the rest of your life. As a nurse, you are entering one of the most demanding professions in the world. But the difference you can make with your touch and care can be almost unmatched. Your patients will always remember your healing touch and caring words. Here are some beautiful and funny nurse quotes that everyone can relate to. These nursing quotes might give you a sense of what makes this profession so unique and special. 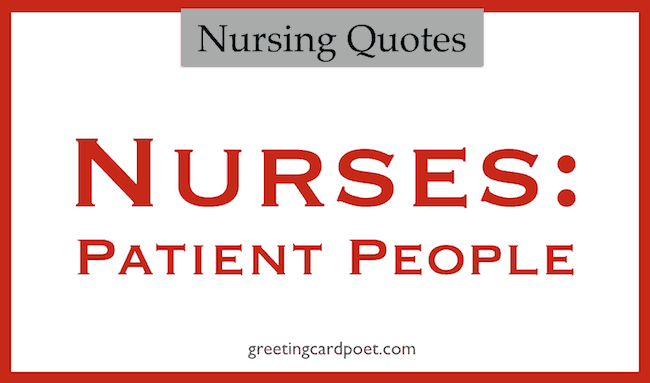 Enjoy these nursing quotes. Nursing is not for everyone. It takes a very strong, intelligent, and compassionate person to take on the ills of the world with passion and purpose and work to maintain the health and well-being of the planet. Rejoice in your work; never lose sight of the nursing leader you are now and the nursing leader you will become. Nursing is not a career, it’s a post apocalyptic survival skill. When I think about all the patients and their loved ones that I have worked with over the years, I know most of them don’t remember me nor I them, but I do know that I gave a little piece of myself to each of them and they to me and those threads make up the beautiful tapestry in my mind that is my career in nursing. I avoid unhealthy looking people at the mall for fear that I may have to CPR on my day off. Nursing: Where else can you experience the thrill of having total strangers poop in front of you like it’s totally your business? A new nurse is excited to sign everything. An old nurse tries not to sign anything. Don’t mess with me — I get paid to poke people with sharp objects. Multiple traumas – A unit full of ventilators and patients trying to die on me all day…I’m sorry what were you saying about your busy day with the stapler? Nursing: Expose yourself to rare, exotic and exciting new diseases! Showering won’t be enough today; I’ll need to be autoclaved. A new nurse writes notes on a pad. An old nurse writes on a napkin, at the back of their hand, or even on their forearm. Be nice to me! I may be your nurse someday, and I’m the one who chooses your catheter size. You think Mondays are bad? Try working weekends, holidays and 12 hours night! Nurse: Just another word to describe a person strong enough to tolerate everything and soft enough to understand everyone. Treat you nurse well. ‘I can walk as slow or as fast as I choose to retrieve that pain medication you requested. Remember, I’m a nurse. You’re going to have to say a lot to gross me out. A new nurse doesn’t want the patient to fall because she doesn’t want him to get hurt. And old nurse doesn’t want the patient to fall because she hates paperwork. You know you are a nurse when you find yourself betting on someone’s blood alcohol content. When a person decides to become a nurse, they make the most important decision of their lives. They choose to dedicate themselves to the care of others. To do what nobody else will do, a way that nobody else can do, in spite of all we go through; that is to be a nurse. You’re going to be there when a lot of people are born, and when a lot of people die. In most every culture, such moments are regarded as sacred and private, made special by a divine presence. No one on Earth would be welcomed, but you’re personally invited. What an honor that is. If Mr. McMurphy doesn’t want to take his medication orally, I’m sure we can arrange that he can have it some other way. But I don’t think that he would like it. Yes. This is what I know. The ward is a factory for the Combine. It’s for fixing up mistakes made in the neighborhoods and in the schools and in the churches, the hospital is. When a completed product goes back out into society, all fixed up good as new, better than new sometimes, it brings joy to the Big Nurse’s heart. First Charles Cheswick and now William Bibbit! I hope you’re finally satisfied. Playing with human lives – gambling with human lives – as if you thought yourself to be a God! I thought for a minute there I saw her whipped. Maybe I did. But I see now that it don’t make any difference…. To beat her you don’t have to whip her two out of three or three out of five, but every time you meet. As soon as you let down your guard, as soon as you lose once, she’s won for good. And eventually we all got to lose. Nobody can help that. Bound by paperwork, short on hands, sleep, and energy… nurses are rarely short on caring. Nurses don’t wait until October to celebrate Make a Difference Day — they make a difference every day! The doctors may be mapping out the war games, but it is the nurses who make the conflict bearable. Nurses are a unique kind. They have this insatiable need to care for others, which is both their biggest strength and fatal flaw. You don’t build a house without its foundation. You don’t build a hospital without its Nurses. I attribute my success to this — I never gave or took any excuse. It would not be possible to praise nurses too highly. As a nurse, we have the opportunity to heal the heart, mind, soul and body of our patients, their families and ourselves. They may forget your name, but they will never forget how you made them feel. Then when you know better, do better! ‎The desire to reach the stars is ambitious. The desire to reach hearts is wise and most possible. If you have other suggestions for nursing quotes and sayings, please let us know via the Contact page. Thanks!